How about eating “pooris” (Indian puffed breads) in valleys among snow-covered peaks? A short trip to moutains with home-made pooris is worth the wait in winters ! But this time we were bored of eating the same plain pooris . So I came up with this idea of making Dhaniya poori and it was a sure hit with everyone. My daughter said,” Our house smells of “Kothimbir Wadi“(Coriander fritters) , while I fried them. They were good with Dry potato curry (sookhe aloo) or with pickles or kethcup. 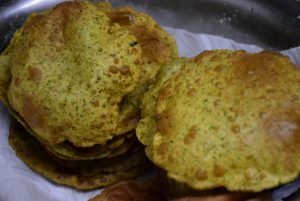 After travelling, hiking, having these pooris was a bliss for all . So let us quickly check the recipe now..
1. We start with washing the coriander leaves /cilantro(dhaniya) in fresh water. I washed 4 to 5 times to remove all the dirt clinging to the bunch. You then coarsely chop them. 2. 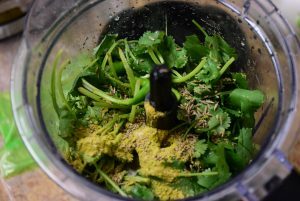 Take a grinding jar and pop these leaves with green chillies, salt, coriander powder, cumin seeds, fennel powder and grind them into a chutney(dip) kind of paste. Add a little water to make them into fine paste. 3. In a tureen (paraat) – a large bowl, take the flour and make a well in it with hands. 4. Add oil and yogurt in it. I added more yogurt to increase their shelf life and decrease the oil content in dough. You may skip it or use only curd instead of oil. 5. 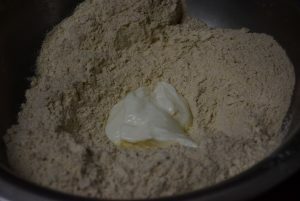 Mix it well with hands in the flour. Now start adding the green dip just prepared. Mix it thoroughly with hands. I forgot the carom seeds, hence added them in the end. Combine all to form a dough. I added just half cup of water to form it in a dough. 7. Divide the dough in equal sized portions and roll them in even roundels between your palms. Keep these pedhas(roundels) covered with a cloth ,so they don’t dry up. 8. Roll some 5 to 6 pooris with a rolling pin and board and keep them covered until the oil is getting ready. 9. 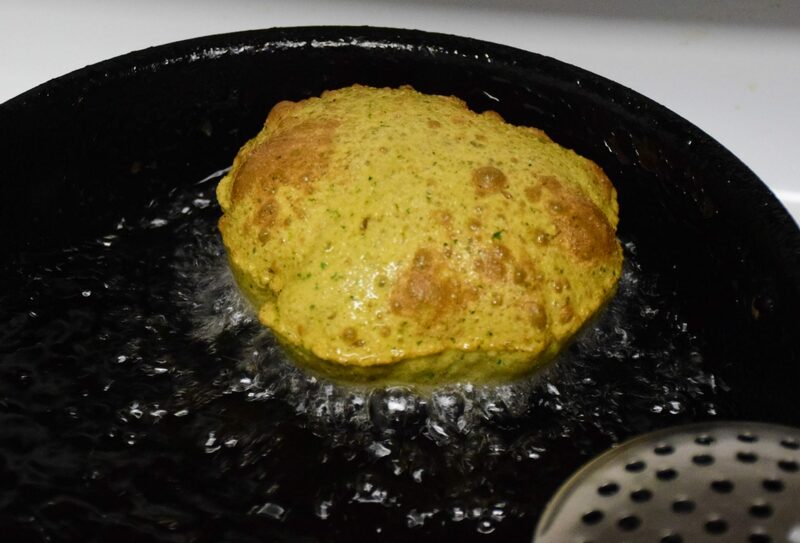 Pick up one rolled poori and slide down through the edge of the wok (kadhai) slowly and steadily in the hot oil. Let it sizzle in oil for 2 seconds. 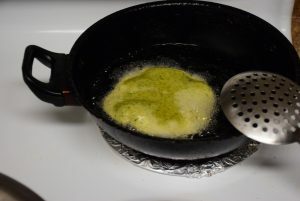 Then either press slightly all over with the slotted spoon (poni used for frying) or pour some oil over it ,to allow it puff up in a ball shape. 10. Once it is puffed, flip it over with poni(slotted spoon) and let it cook on other side too. Once you see brown spots on both sides and change in color ,take it out in a paper towel lined thali(platter)/ plate. 11. Similarly fry all the pooris one by one and take them out after draining the excess oil back in the wok. All my pooris were ready in an hour. I allowed them to cool slightly before packing them . 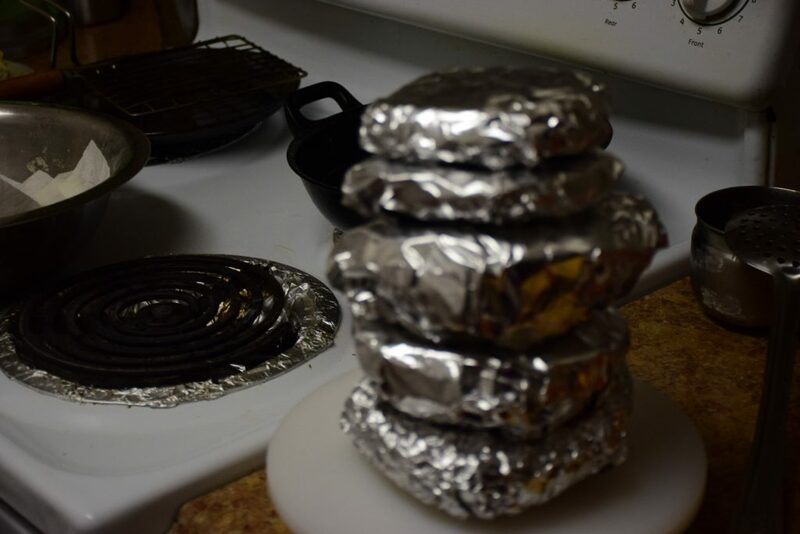 I rolled them in parchment paper and then foil paper, so that they don’t get moist and crumbly. 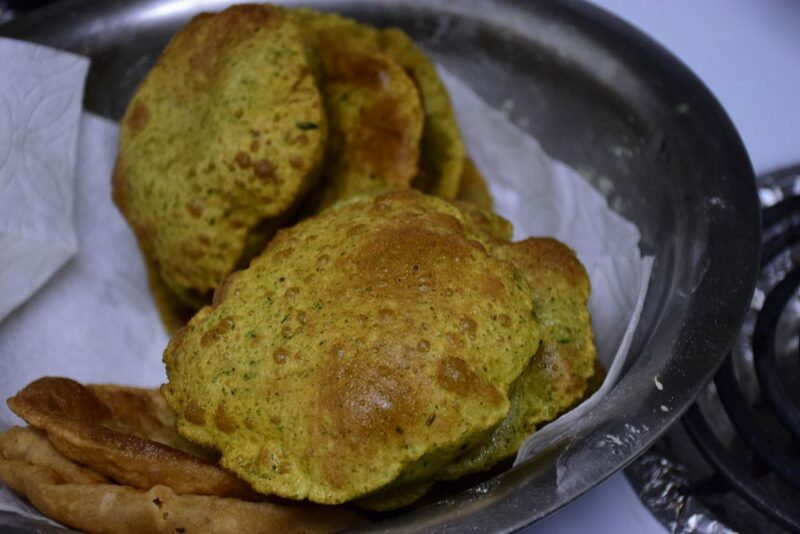 Pooris are good for long-distance journeys and on-the-go snacking. Not only journeys, having them with curries or pickles , is a treat in winter’s monsoon. 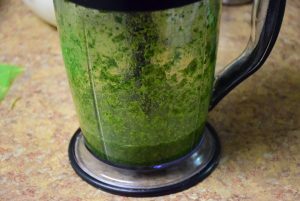 Hope you like this recipe and try out your way soon ! Till then keep cooking and sharing …. How about eating "pooris" (Indian puffed breads) in valleys among snow-covered peaks? A short trip to moutains with home-made pooris is worth the wait in winters ! But this time we were bored of eating the same plain pooris . 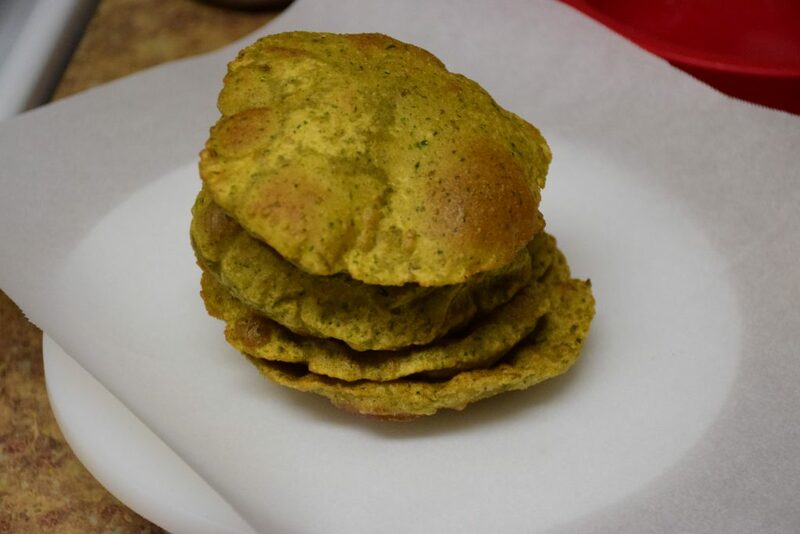 So I came up with this idea of making Dhaniya poori and it was a sure hit with everyone. My daughter said," Our house smells of "Kothimbir Wadi"(Coriander fritters) , while I fried them. They were good with Dry potato curry (sookhe aloo) or with pickles or kethcup. After travelling, hiking, having these pooris was a bliss for all . We start with washing the coriander leaves /cilantro(dhaniya) in fresh water. I washed 4 to 5 times to remove all the dirt clinging to the bunch. You then coarsely chop them. 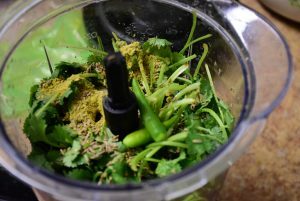 Take a grinding jar and pop these leaves with green chillies, salt, coriander powder, cumin seeds, fennel powder and grind them into a chutney(dip) kind of paste. Add a little water to make them into fine paste. In a tureen (paraat) - a large bowl, take the flour and make a well in it with hands. Add oil and yogurt in it. I added more yogurt to increase their shelf life and decrease the oil content in dough. You may skip it or use only curd instead of oil. 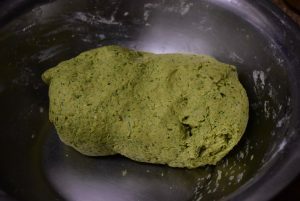 Mix it well with hands in the flour. 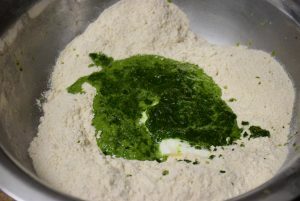 Now start adding the green dip just prepared. Mix it thoroughly with hands. I forgot the carom seeds, hence added them in the end. Combine all to form a dough. I added just half cup of water to form it in a dough. Divide the dough in equal sized portions and roll them in even roundels between your palms. Keep these pedhas(roundels) covered with a cloth ,so they don't dry up. Roll some 5 to 6 pooris with a rolling pin and board and keep them covered until the oil is getting ready. Pick up one rolled poori and slide down through the edge of the wok (kadhai) slowly and steadily in the hot oil. Let it sizzle in oil for 2 seconds. 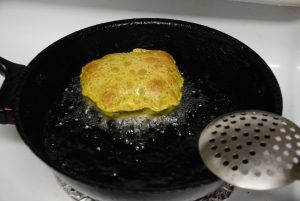 Then either press slightly all over with the slotted spoon (poni used for frying) or pour some oil over it ,to allow it puff up in a ball shape. 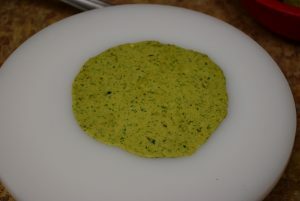 Once it is puffed, flip it over with poni(slotted spoon) and let it cook on other side too. Once you see brown spots on both sides and change in color ,take it out in a paper towel lined thali(platter)/ plate. 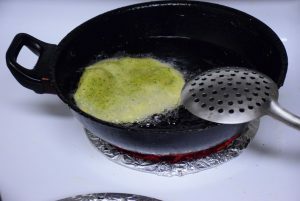 Similarly fry all the pooris one by one and take them out after draining the excess oil back in the wok. 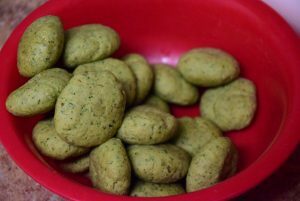 This entry was posted in Food, Kids- Favourite, Recipes and tagged Carenshare, Dhaniye ki poori, dinner packed, free entry to YNP, Green poori, guilt-free, hiking, Kothimbir poori, Kothimbir wadi, packed home-made food, shweta jindal, snow chains, snow-flurries, snowfall, travelling, U.S. shutdown, winter special, Yosemite, Yosemite Valley National Park, YVNP, zindagisikhati.